Q) Why should I become an ABBI member? Q) What kind of samples do I need to take and how do I send them in? A) You can take either a blood or tail hair sample. Samples must be put on ABBI sample cards. Q) How long does it take to get DNA results back from ABBI? A) Typically, when registration paperwork arrives in the ABBI office the animal’s information is entered into the system within a day or two of receipt. Exports are sent to the lab every 7-10 days. We receive results back from the lab every 7 -10 days, with the process within the lab taking 3-4 weeks. A total estimated turn around time is 6 weeks. If there are problems with the samples, you will be notified and we will work with you to solve whatever the issue may be with the sample. Q) What does the DNA status “Failed Testing” for an animal mean? A) This means that the lab has not been able to get a usable DNA sample the first time the blood card was processed. The animal is then ran through another series of testing the following week to again try to collect a useable DNA sample, if possible. Members do not need to send in any resubmits, unless notified by the staff stating that a new blood card and hair sample will be required. Q) What does the status “Multiple” on the breeder's inventory mean? A) When many potential parents, such as running parent testing to a member’s complete inventory of animals, are tested for an offspring, it is possible for multiple qualified matches to occur. When the lab is unable to determine a specific dam or sire from the various qualified parents the results come back as “Multiple”. Please contact the office to go over options regarding this type of status on your animal. Q) What is a “Voluntary Resubmit”? When would I need to do that? A) If an animal is not genetically matching back to the sire, dam or both that you believe it should and we have a good sample on file, you have the option of submitting a “Voluntary Resubmit.” You can voluntarily resubmit a DNA sample for that animal again in this process and we will test against the parents again. We only recommend this when all other options (i.e. when additional DNA research to all possible sires and dams tested) have failed. This service costs $25.00. Q) What is a "Dam Authorization"? A) Dam Authorization is for any dam that is "outside of the herd" defined as any animal that has not been previously owned by you. Dam authorization can be submitted from anyone that has previously owned that animal. -Outside the herd is also used in the Breeder Certificate program. If the bull, has been previously owned by a person those animals that he would have been bred to are consider as part of the herd at the time of enrollment no matter who is putting the bull in the certificate program. Q) If in the original submission of registration, my animal does not DNA back to a sire, dam, or both what are my options? What kind of information do I need to provide? A) You may submit a request for Additional DNA Research. This form is posted on the ABBI website. You must include the animal’s ABBI registration number and the registration numbers for the possible sire(s) and/or dam(s). If you want the animal to be tested back to a member’s whole inventory you can write in the section where you would list the potential sire(s) or dam(s) the specific inventory you want tested. If the sire or dam of the animal is proven through our DNA, include their ABBI registration number in the appropriate section. Please include the birth date of the animal we are testing. Q) Why is the animal nominating, also referred to as naming, process required? A) The purpose of the nominating process is to allow the breeder to choose the animal(s) they feel have the best bucking potential. Once the breeder has nominated the animal and has paid for a position (spot) in the AHF, that specific animal is then eligible to participate. Once the bull has been nominated, that spot is reserved for that bull only. If the position is sold, only the nominated bull is eligible to participate under that spot. There are no bull substitutions. The purchaser of the bull and position is then responsible for maintaining the payments according to the schedule if they wish to maintain the bull’s eligibility. If the animal and spot are sold, the animal must be transferred into the buyers name and a signed letter from the seller must be sent to the office notifying ABBI of the transfer of the animal and sale of spot. Q) When it is time to nominate (a.k.a. 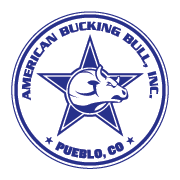 name) a bull or bulls for the American Heritage Futurities (AHF), what do I need to do? · Name – either name the animal or use your herd ID. Q) What information is required to enter a bull into an event? A) To enter an event, the entry form has to be complete with ALL the information required. In addition to the entry form, mouthing charts must be in the office; if they are not already on file, you need to mail or fax them in. A copy of the chart and the registration certificate sent in with the entry will expedite the process. A form of payment (a check, credit card, money order, or cashiers check) is required at time of entry. You are welcome to enter an event online, via fax or by mail. Q) What items are required for Check-in at an event? 3. An Electronic Identification (EID) Tag is in the bull’s ear. If the tag has fallen out you are required to bring the bull’s EID/Mouthing information. 4. If you are going to enter an event and have questions, please contact the office. Q) What is the process required to become an ABBI approved veterinarian? A) The veterinarian must contact the ABBI office and we will provide them with the information that they need to be ABBI approved Veterinarian. Q) Where do I obtain an EID tag? A) EID tags may be obtained from ABBI at the time of animal registration, as long as the animals are being registered in their birth year. After we receive an order for EID tags, the animals' brand numbers will be imprinted on the tags, after which we will ship the tags right to the breeders. If the tags are not ordered at the time of birth year registration, or if the animals are not registered in their birth year, then the animals must be taken to the vet between the ages of 18 - 34 months according to their registered date of birth for age verification. The vet will order the tags from us, and we will ship the tags to the vet for application. EID tags cost $15 plus shipping & handling.